And this past week I most definitely started "NESTING". 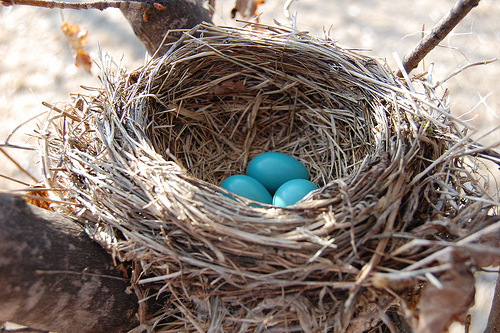 I had heard tons of women talk about nesting, and how they went on cleaning spurs and different things like that but I didn't really think that I would go through a nesting phase...but boy was I wrong! So to sum up this past week I probably spent 20 hours making silly shutterfly photo albums...I wont even go into to detail on how I was determined to find COUPON CODES for all 3 albums (however after making a few trips to Best Buy and bartering on ebay I did find 3 coupon codes lol). I finally finished Josselyn closet! (I have everything organized by months and all the clothes that are 6 months + are neatly in storage bins under my bed). I bought satin material from Joanns fabric and then took it to the tailor so the new bumper ribbons could be put on the bumper (don't ask me why I was bound and determined to have bigger bows on the bumper but I was and It will be ready this Tuesday!). And I finally almost have my overnight hospital bag packed (It has taken longer then expected becasue I have been to 6 stores trying to find a black robe to match my black & white nursing PJ's...that is not an easy item to find in August). But all in all things are getting prepared for Josselyn's arrival! 39 Week Dr Apt Update! Our Hospital Bag Is Finally Packed!